This was a spare of the moment game. The intent was 3 Franco-German Infantry Divisions (with French, Westphalians, Wurttemberg, Nassau, Berg and Italians) and 3 cavalry Divisions with about 7 batteries vs the Russians (2 Infantry and 3 Cavalry Divisions), Prussians (1 Brigade with 2 batteries) and Austrians (1.5 Infantry Divisions & 1.5 Cavalry Divisions and 3 Batteries). 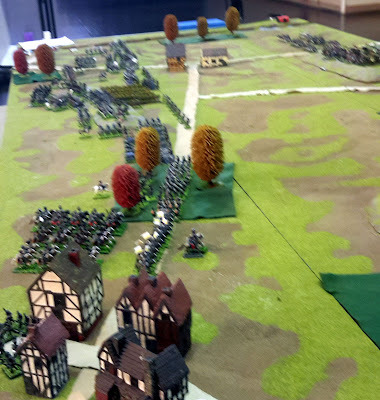 This was the intent but the French got carried away and we ended up with an extra infantry division and about twice the Cavalry force and twice the artillery (the French could not setup all their forces on the table top). Anyway the game was large lots of troops and fun for all. These games are a fill until we start our 1812 Peninsula Campaign. The Russians held the Centre of the Allied line. Austrian Advance Guard and cavalry advancing on the French Left Flank. Russian Hussars overrun a French battery. Wurttemberg Jaegers advance and form square in a wood!! There was just masses of French cavalry.